Fleet and driver safety is a top priority for most fleet professionals. One of the key methods for improving driver safety is by monitoring and coaching driver behavior through telematics. And now, fleets have the opportunity to leverage the power of Donlen’s DriverPoint® Telematics, without the need for telematics device installation, by integrating the data provided by OnStar from their GM Fleet vehicles, after first obtaining appropriate driver notice and consent. Donlen’s proprietary telematics solution, DriverPoint, can not only help improve fleet safety, but reduce fleet costs as well. Customers who have implemented DriverPoint to monitor driver behavior, such as harsh acceleration and deceleration and speeding, have improved the safety of their fleet and reduced their accident rate up to 10 percent. 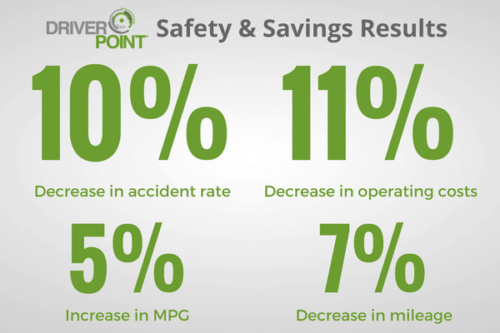 In addition, implementing DriverPoint has the potential to reduce a fleet’s operating costs up to 11 percent. Donlen is proud to deliver a streamlined solution for fleets with OnStar-equipped and activated GM vehicles so they can take full advantage of DriverPoint’s capabilities without the need for device installation and management – saving time for fleet managers and drivers, providing seamless data access, and reducing driver tampering. With data provided by OnStar integrated with DriverPoint, fleet managers receive driver behavior and location and vehicle diagnostics data directly from the vehicle – no additional hardware required. This saves time for both fleet managers and drivers, as it reduces time spent shipping, installing, managing, and returning telematics devices. You may be asking, “But what if all of my vehicles are not GM vehicles?” No problem! Whether the data is captured from telematics devices or OnStar, it is all accessible in DriverPoint. With data provided by OnStar and integrated in DriverPoint, no matter which solution you choose, you can easily view all of your vehicle data in one interface. OnStar provides data directly from the vehicle and cannot be easily disabled or unplugged, which prevents drivers from tampering with devices. By reducing the risk for driver tampering, OnStar ensures a high level of accuracy for your telematics data. With data provided by OnStar integrated with DriverPoint, we’ve made data that is already being captured by the vehicle available to the fleet manager in order to allow for coaching and training, when appropriate, to improve driver safety. OnStar telematics integration helps make it even easier for fleets to improve driver safety and reduce costs with DriverPoint. Want to learn more about how you can drive safety and savings for your fleet with DriverPoint and OnStar? Contact us.